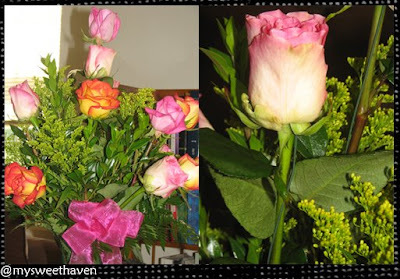 Yesterday was plain and ordinary but not until I received flower delivery in the afternoon while I was busy blogging. I didn't wanna open the door 'coz I wasn't expecting any package and I guess it's just safe if I just ignore whoever's ringing the doorbell but oh boy, the person was persistent. Much to my surprise, a pretty bouquet of flowers came to view when I opened the door. Of course it was from my sweet hubby Jeff. He likes to do that every now and then. He was busy working so who would have thought that he still thinks about sending me flowers on an ordinary day. I love that about him. He never fails to show me that he cares. I guess I'm one of the lucky wives who got charming and thoughtful husbands. I took a close-up shot of the roses. I so love the colors of these two. The ones dito sa Pinas monocolor lang e.
Do they smell sweet too? wow hehehe sweet sweet ni hubby. 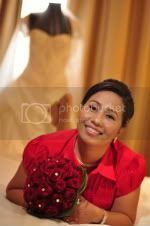 very pretty flowers pa jud. samot ta ka inlab ana jen? Hmmmmm... That's so sweet and thoughtful of him. Your Jeff is very much like my Dana!!! you hubby is so sweet! keep the love alive..
that's very sweet of him.. your one of a lucky girl that even though na masking busy jud imong bana.. hay.. still he can't get rid of you on his mind..
that is so sweet!!! who wouldn't love those kind of surprises. i can imagine you with a big smile on your face ate Jenn.